Detectives from the Los Angeles County Sheriff’s Department Missing Persons Unit are seeking the public’s assistance in locating Robert Miller. 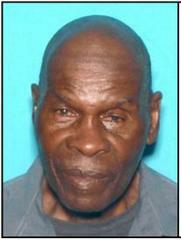 Mr. Miller was last seen on Tuesday, July 24, 2018 at 2:00 P.M. at Burrell Mc Donald Park in Compton, CA when he asked someone for directions to the bus stop. He has not returned to his Compton residence. Mr. Miller is 81 years-old, 5’10” tall, weighing 155 pounds, bald with brown eyes. He was last seen wearing a beige hat, blue shirt, and blue jeans. 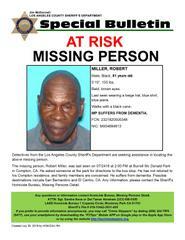 Mr. Miller suffers from dementia and the family is concerned for his well-being. They are seeking the public’s help in locating him. Possible destinations include San Bernardino and El Centro, CA.